CAS 36 (Jacob Reedy-Bartlett 2, Jaylen Grey, Haele Finau, Kruz Niutili-Schmidt, RJ Roma, Jermaine Tui tries; Jaylen Grey 4 goals) def. NSWCIS 20 (Daniel Ala, Cooper Jenkins, Kobe Rugless, Harry Wilson tries; Harry Wilson 2 goals). QSS 34 (Jake Simpkin 2, Tom Dearden, Will Evans, Hamiso Tabuai-Fidow, Sebastian Winters-Chang tries; Tom Dearden 4, Joshua James goals) def. ACT 29 (Matthew Dragisic, Ngarima Low, Cooper O’Connor, Brayden Robertson, Soonafai Tuifelasai tries; Brayden Robertson 4 goals; Brayden Robertson field goal). NSWCCC 28 (Ethan Clark-Wood 2, Stephen Crichton, Thomas Giles, Kyle Pickering tries; Jock Madden 4 goals) def. 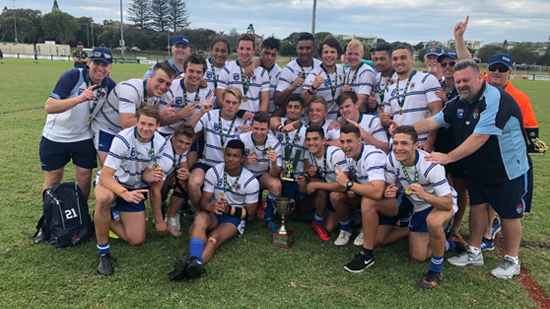 NSWCHS 14 (Harry Croker, Tommy Talau, Starford To’a tries; Jonaiah Lualua goal).